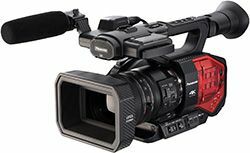 Panasonic released a firmware upgrade for its AG-DVX200PJ 4K large-sensor, 4/3” handheld camcorder. The upgrade, free to DVX200PJ customers, is labeled Ver. 1.51 and can be downloaded here. AG-DVX200PJ 4K Handheld CamcorderThe new firmware changes the default color palette of the camera to a more natural look designed to decrease the need for an adjustment. The DVX200PJ’s color adjustment tools and scene file settings can still be used to customize the image to the operator’s needs. End-users who have created custom looks using the previous default color settings can still use these settings by reverting to the original base color settings designated as Ver. 1.4 in the camcorder menu. The original color setting can be found by navigating to Menu > Other Functions > Color Tones. The DVX200PJ is the first in a new generation of large sensor, multi-format professional camcorders capable of capturing 4K/UHD, HD and SD, including cinematic DCI 4K 4096x2160. The camcorder is optimized for 4K/HD production, with advanced bokeh effects and a V-Log L curve (measured at 12 stops) emulating the natural grey-scale rendition of the VariCam 35. The DVX200PJ incorporates a newly-developed 4/3” large-format MOS sensor with sensitivity of F11, and offers variable frame rate recording from 2fps to 120fps in 1080p mode. The handheld 4K camcorder offers professional features including a newly-designed Leica Dicomar 4K F2.8~F4.5 zoom lens (4K/24p: 29.5 mm ~ 384.9 mm, HD: 28 mm ~ 365.3mm, 35 mm equivalent) with shallow depth-of-field, time-code in/out, 3G HD-SDI and HDMI 2.0 (4K) video outs (4:2:2 10-bit video), dual XLR audio inputs and 10 programmable user buttons.